BSMC-CR-01 is used in the Same Game cartridge, and is a 512KiB ROM. You can read it out through $c0-c7:0000-ffff. But if you put BSMC-BR-01, it goes poorly. It is as if A0 is not connected. So if you read $c0-c7:0000-ffff, every odd byte ends up identical to the even byte. Ex: "GNEXT DATA" reads back as "GGEETTDDTT"
In order to read this cartridge, it needs to be put in SD Gundam G Next. Only on this cartridge, it's not mapped on the bus by default. As an SA1 game, you have to set a super MMC bank to #$04 to access it. So with $2220=#$04, you can now read the BS Memory out correctly from $c0-c7:0000-ffff. What is confusing me is ... this ROM is also 512KiB (both mirror after that), despite having four extra pins on the ROM chip. And why is there the A0 oddity on the Same Game cartridge? I want to emulate this behavior so that if you insert BSMC-BR-01 into Same Game, it acts the same. And I still need to try reading out BSMC-CR-01 from SD Gundam G Next to see what happens. Anyone have ideas on what might be going on here? These cartridges have an obscene amount of pins for what they are ... if someone knows the pinouts of the cartridge connector and the ROM chips, I can bring out my multimeter to trace where the mask ROM pins are going. The extra pins, and spacing between traces on the right end of the IC, implies that that's a ROM that could support a 16-bit bus. In this case, there's a pin that's pulled high or low to control whether the ROM is in 8-bit or 16-bit mode (often called "!BYTE"), and when in 8-bit mode, the D15 pin instead serves as A-1. 40 pins, 16 bit data bus, 3 pins for /CE /OE and /BYTE, usually 3 pins for power (see JEDEC 21C figure 3.5.2-4)... that's 512 KiB of data, yup. There are two conflicting numbering schemes for the 62pin connector. There are some connection variants: The Itoi cartridge with SA-1 is using 16bit databus (with extra data lines on pin53-60), pin12 seems to be connected to something, some of the pull-up/pull-downs and VCC/GND pins on pin 14-34 and 52 may be wired differently. REFRESH (SNES.pin33) is forwarded to FLASH cart slot (for unknown reason, maybe it was intended for unreleased DRAM cartridges). SYSCK (SNES.pin57) is forwarded to FLASH cart slot (for unknown reason), and is also forwarded (via 100 ohms) to EXPAND (SNES.pin2) (and from there forwarded to the BSX Receiver Unit on SNES Expansion port). How in the world?? The SNES is an 8-bit data bus. Why would they wire a ROM to 16-bit data mode? How would that even work?? The datapak ROM connects to the SA1 chip, not to the SNES cpu. 16bit databus isn't so uncommon in SNES carts - it's used by SA1 games, and at least by some games with data-decompression chips. 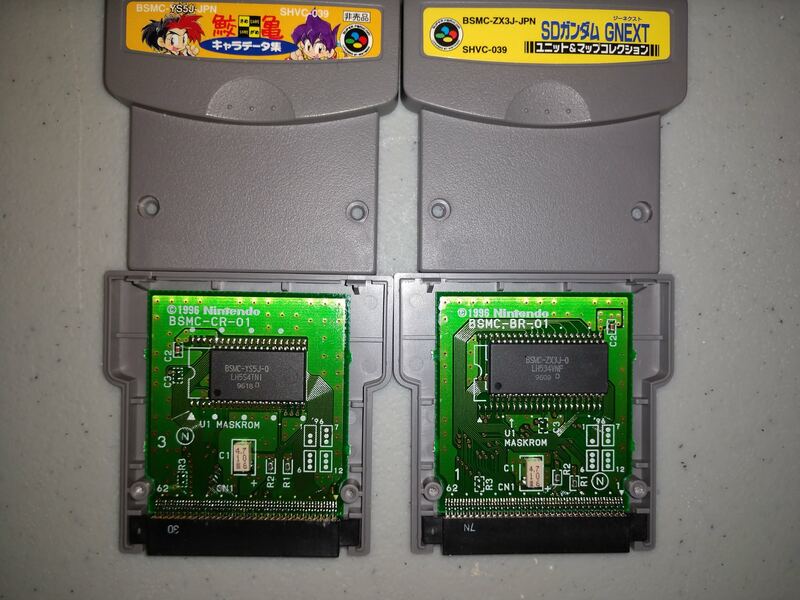 The only uncommon thing is that the 16bit datapaks are removeable - allowing to connect them to other carts that can't read them in lack of 16bit bus. Yes, but what can the SA1 CPU do with that? The SA1 is yet another 65816 that can only read 8-bits per clock cycle. I was under the impression that it had a memory controller to feed the CPU one byte at a time, which would explain how it manages 10.74 MHz on affordable ROM but sees wait states whenever it hits a branch or data access.